Chris Portier, Ph.D., an activist statistician who pushed to get the common herbicide ingredient glyphosate listed as a "hazard" for carcinogen labeling purposes while with the International Agency for Research on Cancer, only later revealed he was on the payroll of an anti-science litigation group that was targeting glyphosate at the time - Environmental Defense Fund. 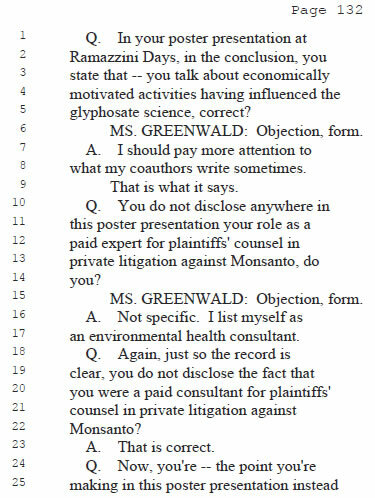 A court deposition and the implicit threat of perjury should he lie forced Portier to disclose he was also being paid by a lawyer who wanted to sue over glyphosate once he helped get it declared a "probable" carcinogen. That left glaring questions: How did the law firm learn of the IARC decision weeks before the paper was released? Was it just coincidence they hired Portier to help them as an expert because he was at IARC when the decision came out? It certainly looked suspicious. So suspicious that if anyone in the pro-agriculture arena did it, organic industry ally Eric Lipton, who practically prints press releases written by Organic Consumers Association industry front group US Right To Know in his columns, would be writing a whole series at the New York Times about how evil scientists and corporations are. But about Portier...nothing. Why didn't they come up with any "secret" documents showing this? The answer is well known by now. Secret documents were being leaked by the trial lawyers to organic industry groups who are paid to promote competitors to farmers who use glyphosate. This is a rather precise, and therefore interesting, parsing of terms. In his opinion? Deniers for hire like Mike Balter and Paul Thacker, along with activist journalists (see a whole list here) insist any non-profit who has ever gotten a donation from a company in their entire history remains conflicted...for all eternity. Yet I have been unable to find a single criticism of Portier by any of those paid flacks and journalists. They are not skeptical when someone helping them in their culture war claims he was only paid by EDF to promote climate change. 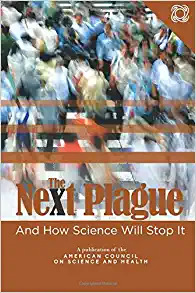 They pretend to believe that EDF hired a biostatistician with no expertise in climate issues to work on climate change rather than work on the chemicals he scaremongers. Instead he was let off by sympathetic journalists even though they know he was working for attorneys suing over glyphosate - while telling European and American regulators they should ban the product because his work at IARC declared something no other scientific body had. 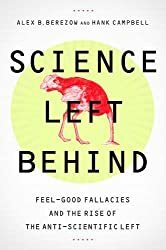 Since EDF wants to help epidemiologists helping advance their lawsuits, they won't dispute his "in my opinion" claims the way they would if a pro-science person said it. And less-than-credible journalists will willingly put on blinders and pretend it did not create a conflict of interest to get glyphosate labeled a carcinogen when he was reliant on income from them and he knows they lobby against glyphosate. 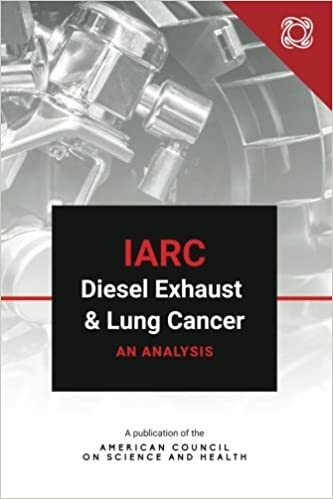 Why did IARC create policy that no one who had ever gotten a grant from a corporation, or been an employee of a corporation, could be on their working group. but exempt working for EDF or other anti-science NGOs? They didn't need any policy if they will just accept "in my opinion" by a participant that they are not conflicted. It's all a little too convenient. But when it comes to lawyers and activists out to undermine public confidence in science, it's all too common.